Thames Quarter, a development of one, two and three-bedroom apartments, will be ready for occupation in 2021 and is the latest deal made on behalf of the M&G UK Residential Property Fund managed by Alex Greaves. Watkin Jones will act as developer and contractor with the opportunity acquired from Lochailort. The scheme includes 10,000 sq ft of facilities including a residents’ lounge overlooking the Thames, a tech hub, cinema, dining rooms and roof terraces. 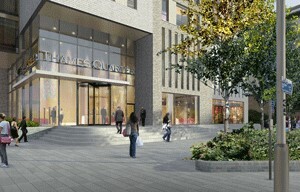 Alex Greaves, ‎Head of Residential Investment at M&G Real Estate, said: “Thames Quarter provides scale, first class amenities, intelligent design and goes a little way to addressing the shortage of quality private rented accommodation in Reading. M&G Real Estate has overseen circa £400m of investment since 2014, announcing the largest office letting in the Thames Valley market in a decade when SSE signed terms to occupy Number 1 Forbury Place in 2015. Campbell Gordon represented M&G Real Estate and CBRE represented Lochailort.